Baby chick feeder. Item #: 9810. Made of heavy-gauge galvanized steel for years of service. -Heavy-gauge galvanized steel for years of service. Made of heavy-gauge galvanized steel for years of service. Rounded, embossed edges help reduce chafing on chicks' neck and head. 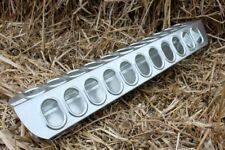 Eight feeding holes. Baby chick feeder. Gravity-feed chick waterer. Heavy-gauge galvanized steel for years of service. For use with Little Giant 12-Lb., 30-Lb., and 40-Lb. Constructed of heavy-gauge galvanized steel for many years of service, with rolled edges for safety. Feeder must be suspended in order to attach this cover. 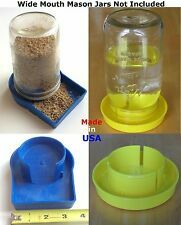 Most of these Chick Feeders use small mouth mason jars.I like the wide mouth jars because you can get your hand down in them and clean them more thoroughly. This is an excellent & unique design. 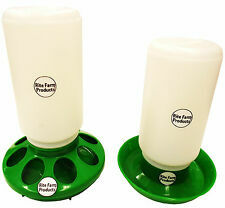 You simply slide your wide mouth mason jar on the chick feeder which is faster & less trouble than the screw on type. The KUHL HF-40 Feeder can be hung and raised as birds mature. Holds 22 lbs. Hanging Feeder with Cover. Space-saving corner design with built-in hooks for hanging in hutch or coop. Sturdy galvanized steel has rolled edges for safety. Galvanized steel. Building Materials And Products. Space-saving corner design.